We’re approaching the 100th anniversary of the U.S. entrance into WWI. Today on Access Utah, we’ll discuss the Great War and how affected Utahns. 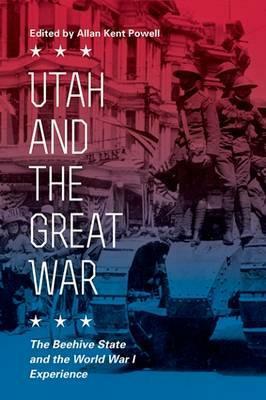 We’ll speak with Allan Kent Powell, Editor of “Utah and the Great War: The Beehive State and the World War I Experience.” We’ll also speak with E.B. Wheeler and Jeffery Bateman who recently wrote a fiction book called "No Peace with the Dawn: A Novel of the Great War." E.B. Wheeler attended Brigham Young University, majoring in history with an English minor, and earned graduate degrees in history and landscape architecture from Utah State University. No Peace with the Dawn is her third novel. She’s the award-winning author of The Haunting of Springett Hall and Born to Treason, as well as several short stories, magazine articles, and scripts for educational software programs. In addition to writing, she consults about historic preservation and teaches Utah history at USU. Jeffery Bateman served in the U.S. Air Force for 32 years, retiring as a colonel in 2010. He holds an MA in history from Utah State University and an MS in strategic studies from U.S. Army War College. Following his military career, Jeff worked as a civilian historian at the Air Force Research Laboratory and the Air Force Flight Test Center. His work as an historian has been published in several peer-reviewed journals and other platforms, including the Utah Historical Quarterly, Airpower History, and the U.S. Army War College Press. Jeff currently teaches Utah history, American military history, and U.S. Institutions at Utah State University. An award-winning member of the League of Utah Writers, Jeff is the author of On the Death Beat, forthcoming in 2017, Grey Gecko Press, and coauthor of No Peace with the Dawn, Cedar Fort Press. Allen Kent Powell received his PhD in history from the University of Utah and was employed for forty-for years at the Utah State Historical Society, where he served as senior state historian and managing editor at the Utah Historical Quarterly from 2002 to 2013. In time for the centennial of the United States’ entry into World War I, “Utah and The Great War: The Beehive State and the World War I Experience,” a collection of essays explores the war experience in Utah from the multiple perspectives of soldiers, nurses, and ambulance drivers who experienced the horror of the conflict firsthand to those on the homefront whom the war transformed. Citizens at home took active roles in supporting the war effort. Some of Utah’s Native Americans and at least one Episcopal bishop resisted the war. The terrible 1918-1919 flu pandemic hit Utah and killed more victims around the world than those who died on the battlefields. A Red Scare and a fight over United States participation in a League of Nations followed the war.